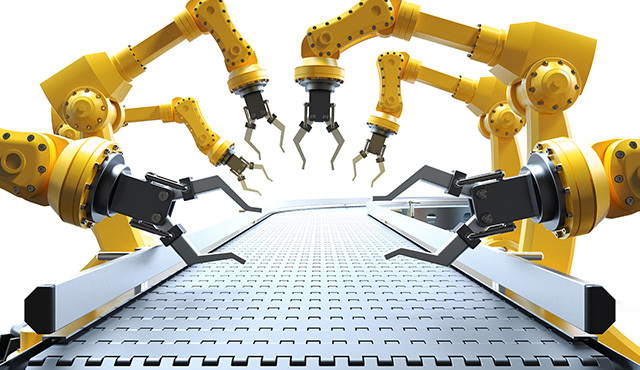 In recent times there has been a strong growth in the use of robots in Australian manufacturing, thus why collaborative robots is currently a hot topic. These robots are designed to operate in cooperation with humans, which presents some new safety considerations compared to traditional robots that operate behind a safety fence. There is a new Australian Standard, AS 4024.3303:2017, which provides guidance on the process involved to ensure your collaborative robot doesn't pose a threat to its human work colleagues. A risk assessment must be carried out to determine if a collaborative robot is suitable for the application. This should also include determining the collaborative workspace of the robot and estimating the risk of the hazards so the appropriate risk reduction measures can be applied. The collaborative workspace is the area where the robot and human co-inhabit during normal operation, see Figure 1 below. To reduce the risk associated with robots and humans working in this collaborative workspace one or more of the following methods can be utilised. This method may be used to provide access for the operator to perform tasks, such as loading a part into the end effector. In this method, the robot will move to the collaborative workspace and perform a safety stop. This allows the operator to enter the collaborative workspace and perform their task. Once the operator is out of the collaborative area, the robot can resume normal operation. If the operator enters the collaborative workspace, when the robot is moving in the collaborative workspace, the robot will perform a safety stop and need to be manually reset. The robot system must be able to detect the presence of an operator inside the collaborative workspace. The size of the collaborative workspace must be determined to take into consideration the speed of the robot, the reaction time of the robot, stopping time of the robot, speed of human movement and resolution of the system used to detect the presence of the operator. This method works similar to the "Safety-rated monitored stop" however, once the operator is inside the collaborative workspace, they can operate the robot with a hand guiding device. This allows the operator to manually control the robot in close proximity for detailed tasks. When the robot is manually controlled, it will perform its movements at a controlled speed deemed acceptable from a risk assessment. If the operator releases the hand guiding device, the robot will stop and when the operator has left the collaborative workspace, the robot can resume normal operation. 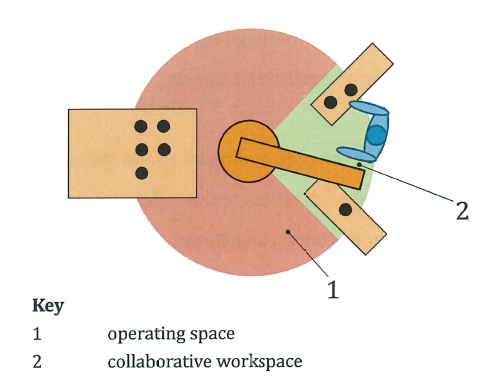 In this method, the robot and operator can work at the same time in the collaborative workspace. The robot maintains a protective separation distance from the operator. If the distance between the operator and robot becomes less than the protective separation distance the robot will stop. The speed of the robot must be monitored because the protective separation distance is reliant on the speed of the robot. The protective separation distance is also reliant on the on the robot’s reaction time and the accuracy/resolution of the system used to detect the distance of the operator. The robot may change its speed depending on the position of the operator to reduce the protective separation distance or the robot may use alternative paths that ensure the protective separation distance is maintained. In this method, the robot and operator can work at the same time in the collaborative workspace and contact between the operator and robot can occur. The energy and force of these collisions are limited below an established threshold limit. A risk assessment process is used in conjunction with data from Annex A of the standard, to determine the suitable energy and force thresholds for the tasks to be performed. Increasing contact surface areas; rounded edges, smoothed edges, etc. Absorbing energy; using padding/cushioning, deformable components, etc. When considering a collaborative robot, it is essential that a risk assessment process is conducted to understand the risks associated with the application. With the use of the new standard, AS 4024.3303:2017, the appropriate collaborative methods can be selected. The standard also provides guidance, on what safety features the robot requires for each collaborative method.